Mulch can freshen up a flowerbed and save you time and money (less weeding and watering). Save by snagging free mulch. Some communities offer curbside pickup of lawn waste, which is then turned into mulch that’s yours for the asking. “If you simply bring a utility bill (to prove you live within city limits) to the distribution center, you can get free mulch by the truckload,” explains Cherie Lowe, blogger and author of Slaying the Debt Dragon: How One Family Conquered Their Money Monster and Found an Inspired Happily Ever After. Check with your local government to see if there is a program available in your area. Some gardeners swear by an even cheaper weed killer: boiling water. Simply pour it directly on weeds, avoiding plants you don’t want to damage. Since it doesn’t cost anything, it is certainly worth a try. One way to make your money go further is to check Craigslist for free or low-cost plants. Garden clubs may also hold plant sales or swaps. Or ask a neighbor for a cutting from one you admire. Better yet, let them know that if they are thinning out their plants you are happy to help them do that — and take what’s no longer needed. When Mary Leonard worked at a garden center, she bought plants at a fraction of their cost at the end of the season. In a story on Stretcher.com, she shared how a generous customer gave her hundreds of dollars in free plants and then revealed that she got many of hers for free by offering to dig them up from homes that were going to be demolished. 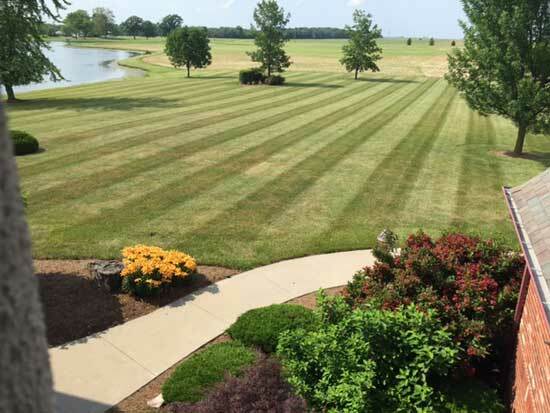 If you live in an area of the country where grass doesn’t grow abundantly, or watering restrictions make it impractical to maintain a lush lawn, native grasses can be a practical alternative. “In drought areas like California, replacing a turf grass with a native or climate-compatible grass can substantially reduce costs,” says Cassy Aoyagi, president of FormLA Landscaping in Los Angeles. Before you plant, get your soil tested to help you understand which types of plants or grasses will grow best on your property, suggests Jeff Oddo, president of City Wide Maintenance. “This will leave you with lush lawns, shrubs and flowers–instead of an unsightly exterior and money wasted on dead and dying landscaping,” he says. Inexpensive testing may be available through your Cooperative Extension service (see the final tip). “Substantial cost savings are possible with native foliage, as they will be naturally climate-appropriate and many are perennial, saving annual planting costs,” says Aoyagi. “Also, natives will thrive without costly chemical fertilizers and pesticides.” These plants can also invite wildlife, such as birds and butterflies, making your surroundings even more attractive. Wild Ones, a not-for-profit environmental education and advocacy organization offers information on starting native plant projects. Try outdoor lighting. “Outdoor lighting can be done for as little as $50,” says Steve Bollinger, owner of Landscaping by André, Inc. in Scottsdale, Ariz. “You can add night time visibility, security, decorative and do it yourself for anywhere from $50 to $500, depending on the size of your space,” he says. “LED solar lights can add a warm hue (and safety) to your environment and they are great for areas used for entertaining since they don’t attract bugs,” says Danyelle Kukuk, VP Category & Product Management at Batteries Plus Bulbs. For spot and flood lights, she recommends LED bulbs: “These will save 86% energy, last over 20 years, and retain light levels so the yard will shine bright even when autumn comes back around,” she says. Feel free to share your best tips for saving money on landscaping in the comments! These days, it seems people rarely like the news they hear from the airline industry, and an announcement made June 9 was no different: Many airlines plan to further limit the size of carry-on luggage. Based on the flurry of reactions to the news posted on social media, consumers aren’t happy about this. Currently, the standard for carry-on luggage (the one that goes in an overhead compartment, not the “personal item”) limits bags to those no larger than 22 inches long, 14 inches wide and 9 inches deep, including handles and wheels. The International Air Transport Association (IATA) introduced a new standard called IATA Cabin OK, restricting carry-on baggage to 21.5 by 13.5 by 7.5 inches. In addition to helping you earn miles faster, as many airline credit cards do, MileagePlus cardholders can have their first bag checked for free, as well as the bag of one travel companion. Other perks include priority boarding, no foreign transaction fees and two United Club passes per year. The card has a $95 annual fee, which is waived for the first year. When you fly American Airlines you can get a free checked bag for yourself and up to four travel companions when using this card. Cardholders also receive priority boarding and discounts on in-flight purchases. The card also has $95 annual fee that is waived in the first year of membership. Delta offers a few SkyMiles credit cards through American Express, with different levels of benefits, and not all include a checked bag for free. The Gold card does — the card’s terms and conditions say cardholders can request a maximum of nine baggage-fee waivers per reservation, but that’s only for first bags, meaning you can only max out that benefit if you’re traveling with eight other people (and you booked the trip using your card). The card also provides a discount on in-flight purchases in the form of a statement credit. The $95 annual fee is waived the first year. You and a fellow traveler can check your first bags without an additional fee when using one of two Virgin credit cards. The premium card has a $149 annual fee, and the standard card charges $49 per year (they have different rewards, but the baggage perk is the same). Pretty much every airline offers a credit card, but the benefits vary widely. There’s also no knowing how these benefits will change in the future, though offering a free checked bag will likely attract more customers, as airlines adopt new baggage restrictions. Additionally, there are a lot of credit cards that reward travelers, without requiring the cardholder to patronize specific companies. Above all, it’s important you apply only for credit cards you feel you can use responsibly — rewards cards typically carry higher interest rates than basic credit cards, and many charge annual fees, so if you’re not paying the statement in full or using the benefits often, the cost can outweigh the rewards. Above all, you should apply only for cards you will likely qualify for, because applying for new credit will have a small and temporary negative effect on your credit score. To get an idea of what credit card offers may be available to you, review your credit standing frequently. You can get two free credit scores every month on Credit.com. With things like Netflix, cellphones and tablets, it is hard to get kids away from technology. The Kaiser Family Foundation did a study suggesting kids today are spending up to 75 hours a week on things like the internet, Netflix, and smart phones. Recently, I came across a quote by a first grade teacher that said, "Yes, kids love technology, but they also love Legos, scented markers, handstands, books, and mud puddles. It’s all about balance." Why not try these 13 successful summer activities that will help to get your kids to look up from their tablets and cellphones? Visit the library: It sounds old fashioned, but the kids loved it! I got them their own library cards and my stepson went from fighting us to read to reading at least two books a week. Camp at home: My 8-year-old really loved the idea of pitching a tent in the backyard and camping out with his dad. If you already have a tent, it is a really great idea for some quality time, and you can snack on things like s’mores. Make them a photographer for a day: If you have an old camera or phone with a camera lying around, give it to the kids and let them go crazy. We caught all kinds of moments on "film." We got to see things through the eyes of our children and printed out our favorites to keep! Museums: It sounds boring, but today there are so many different types of museums, including science, art, children’s, and music museums. Many have free admission or half off during the summer. I even get emailed offers from my bank for free admission days to local museums. Write to pen pals: It’s a great way for kids to get to know others while improving their writing skills. You can find people across the country or half way across the world and learn about new things with your kids. Check out places like Amazing-Kids.org, or if you think they would like to write to a solider overseas, AdoptAUSSoldier.org is a good one. Acts of kindness: I don’t think I am alone when I say that many of us would like our kids to learn to think of others more frequently. Occasionally, I like to put each family member’s name in a bowl, have each member pick one name, and give them one week to do something nice for their chosen person. Make a rock garden: Pick out some rocks and let the kids paint them. After they dry, spray them with a clear coat to protect them from weathering. We let the kids find a place in the garden to "display" their work. It’s something we will be able to keep for years to come. Start a summer reading challenge: Get a poster board to keep track of books that were read and offer rewards for reading! Discount movie day: Many movie theaters are offering movie tickets for as little as $1! Regal Cinemas is one that I know of in my area. Make your own water park: Bring out the sprinklers and kiddie pool. Make your own larger homemade slip and slide using a piece of vinyl, some pool noodles, and the hose. If you want to add a little speed, just add a small drop or two of tear free baby shampoo. Find kid workshops: Many chain stores (Home Depot, Lowe’s, Michael’s, Barnes and Noble, etc.) offer workshops for kids for little to no cost. Lowe’s and Home Depot offer the kids an apron as part of the workshop where they get to build things. Barnes and Noble offer story time for kids while the parents get to shop around. Get involved: Volunteer! It sounds silly, but it is a great way to show the kids the importance of helping others. Volunteer.gov is a great site to find places near you looking of all kinds of volunteers. Write a short story: Get a notebook and make up a short story the kids get to illustrate! My 14-year-old wrote the story while her brother got to draw the pictures. All the things listed are low cost to free and with minimal use of electronics. Try out a few of the things on the list and you might be surprised at how little your kids will miss the technology! Visit TheDollarStretcher.com for more summer fun ideas. Is renting a home the new American dream? A report by the Urban Institute projects that even after the housing crash and the Great Recession are a distant memory, homeownership rates in America will continue to decline. The report estimates that between 2010 and 2030, the majority (59%) of the 22 million new households that will form will rent, while just 41% will buy their homes. Wages. Real wages have declined among adults ages 25 to 34 since 1996. “Even for young adults with good jobs, low vacancy rates and high rents make it more difficult to save,” the report says. Student loan debt. Total outstanding debt was about $300 billion in 2003; now it is over $1.3 trillion. Long-term debt makes additional long-term debt less appealing. Delayed household formation. Both women and men are waiting four years longer before marriage than in 1980. “Because of the delayed marriage and childbearing, homeownership is apt to occur later. At a result, people will spend less of their lives as homeowners, placing a drag on the homeownership rate,” according to the Urban Institute. Lingering effects of the recession. Roughly 7.5 million Americans lost their homes during the recession; most will have a hard time buying a new one, dragging down the homeownership rate. They’re not that into homebuying. More Americans are consciously choosing to rent over buy. One study looked at “prime candidates” — married couples earning at least $95,000 annually who have at least one child. “Even for this group, after controlling for race and ethnicity, the homeownership rate declined from 87.3% in 2000 to 80.6% in 2012,” the report says. The report also considered changing demographics — a majority of new households formed in the U.S. during the next two decades will be non-white — and while those groups traditionally have lower homeownership rates, the Urban Institute found that will not contribute significantly to overall homeownership rates in the future. That story is a mixed bag, however. The shift from owning to renting means that many more rental units should be built, the Urban Institute says. “This change will create a surge in rental demand from now until 2030 that we are unprepared to meet,” it says. It also suggests that mortgage lending standards be relaxed to nudge more would-be renters to buy their homes. That conclusion doesn’t sit well with everyone, however. Logan Mohtashami, a California-based loan officer, says the notion that lending standards are tight is a myth. VA loans require no down payment, for example, he notes. And buyers can get other mortgages with credit scores as low as 560, with 50% debt-to-income ratios, or down payments as low as 3%. Have you thought about long-term care insurance? Most people don’t until they are approaching retirement and the thought of turning over their life savings to a nursing home drives them to consider it. Statistics vary from source to source, but roughly 70% of those over age 65 at some point will need long-term care, defined as the services needed when you are unable to care for yourself. Those services can range from help with bathing, feeding and walking in your home to full-time care in a facility. Long-term care insurance can help cover the costs of care, but how do you know what kind of policy to buy, or even if you should purchase a policy in the first place? Here are some tips. The costs of long-term care can be paid for out of pocket (self-funded), by Medicaid, covered by an insurance policy, or some combination of these. Often people assume that Medicare or health insurance will cover their care, but in reality these only cover a small portion of the necessary care, and typically for skilled nursing care only, not for the custodial care usually required in the case of a long-term illness or condition. Medicaid, on the other hand, will pay for custodial care — most often in a facility. But while we all are entitled to Medicare, not everyone qualifies for Medicaid — only those whose assets do not exceed their state’s eligibility limits. Living on a fixed income in retirement can be tough to begin with, so for many, adding in the cost of a long-term care insurance policy is out of the question. For them the only option may be to pay for care out of pocket and then go on Medicaid when their assets are depleted. Others may have a surplus that can cover the cost of care should it be needed. But those in the middle, for whom long-term care insurance premiums are within their budget, should at least consider purchasing a policy to cover some of the costs associated with care in a facility or at home. Purchasing long-term care insurance can be viewed as protection for your portfolio in that sense; if you can use your insurance benefit rather than your assets, you have preserved them for yourself or your heirs. Even those who can afford to self-insure may choose to purchase long-term care insurance for that exact reason. When should you buy a policy? The best time to buy any insurance policy is the day before you need to use it, but since none of us can know that, the next best time would be when you are in your late 50s or early 60s. The initial premiums go up the older you get, so even though you are paying the premium for a longer period of time, buying earlier can save you money in the long run. Long-term care insurance policies can be customized to fit your needs and your budget. The choices you make affect the premium, so it makes sense to look at various combinations. In choosing your elimination period, or the number of days of care you pay for before the insurance kicks in, consider how much you can afford (or want) to cover. Typical elimination periods range from 30 to 365 days. Clarify with the insurance company if those are calendar days or days of care. If you start out needing care three days a week, a 30-day elimination period may actually be 10 weeks. Some policies offer a zero elimination period when the policy is used for home care. The benefit amount is the dollar amount available to pay for care each day you are on claim, in today’s dollars. With the high cost of care, funding the entire amount of care with insurance is likely to be very costly. Some policies aggregate the daily benefit amount into a monthly or lifetime limit amount, so when you don’t need coverage every day of the month, even if the cost exceeds your daily benefit amount, you still may be covered. According to Genworth’s Cost of Care estimation, the average annual cost of nursing home care in a private room in the Johnstown, Pa., area is $87,600, while in Manhattan you’d pay a hefty $182,500! Inflation protection riders are an important part of a policy. Without this kind of rider, your benefit amount may be dwarfed by the quickly increasing costs of care. You may choose a rider that increases your benefit amount yearly by a specified percentage based on a simple interest calculation or a compound calculation. The compound will increase faster and more readily keep up, but it is also more expensive. Some companies offer an increase based on the consumer price index, and others allow you to purchase additional insurance at specified intervals in the future, with those additional benefit amounts calculated on your then-current age. The benefit period is the number of years your policy will pay for, usually between two and 10 years, or even a lifetime. The lifetime benefit, as you might expect, is very expensive. The average nursing home claim is two and a half years, and the average home care claim is about four years. If you have a spouse or domestic partner, a shared care policy may be right for you. These policies combine your individual benefit periods to be used by either one of you or both. Instead of two single three-year periods for instance, you would have six years combined; one could use four, leaving the other two, or any other combination. To encourage more people to purchase their own insurance and not rely on government aid, many states partner with insurance companies. If you purchase one of the eligible “partnership” policies, for every dollar your insurance policy pays, you are able to retain an additional dollar above the Medicaid guidelines and still qualify for assistance when your benefits run out. You’ll want to make sure your policy includes 100% of your daily benefit amount as coverage for home health care. In many ways, long-term care insurance can be thought of as nursing home prevention insurance, if it allows you to be cared for at home as long as possible. Also find out what you have to do to make a claim; when you are dealing with a health crisis, you certainly don’t want the aggravation of fighting an insurance company for your rightful benefit. When comparing quotes from different companies, in addition to the premiums, you’ll want to consider the financial stability of the issuing company. And before deciding to purchase, make sure your budget can handle potential premium increases. It was unheard of to raise premiums on existing policy holders until recent years, when premiums on some policies increased more than 25%. Dropping the policy because you can’t absorb the future increases is counterproductive. Finally, when you are ready to start the buying process, work with an insurance agent, broker or financial adviser you trust, who can explain all of your options and steer you to the policy that is best for your individual circumstances. This article by Erin Baehr was distributed by the Personal Finance Syndication Network.